Energy efficiency and management: for example, deep lake water cooling, retrofitting older lighting, and motion detectors in meeting rooms. Transportation: providing alternatives to automobile commuting such as proximity to frequent public transit, public transit subsidies, cycling facilities and lockers/change facilities. Water conservation and management: includes low-flow toilets and faucets and a written water conservation policy. Emissions, effluents and pollution controls: for example, old natural gas boilers have been replaced and modernized. Environmental purchasing plan: a sustainable procurement policy supports local products and reducing volumes, packaging and toxicity. Documented environmental policy, goals, targets and action plans: exercising due diligence and compliance, as well as developing mitigation strategies and setting carbon reduction targets. The Metro Toronto Convention Centre is Canada's No. 1 convention and trade show facility. 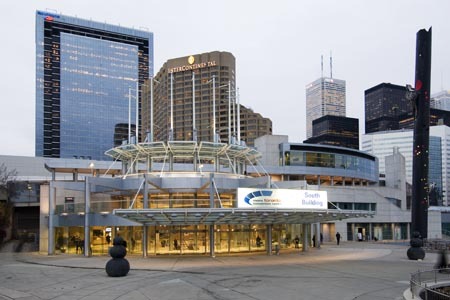 Since its opening in 1984, the MTCC has hosted approximately 15,000 events and entertained over 40 million guests. For further information, please visit www.mtccc.com.